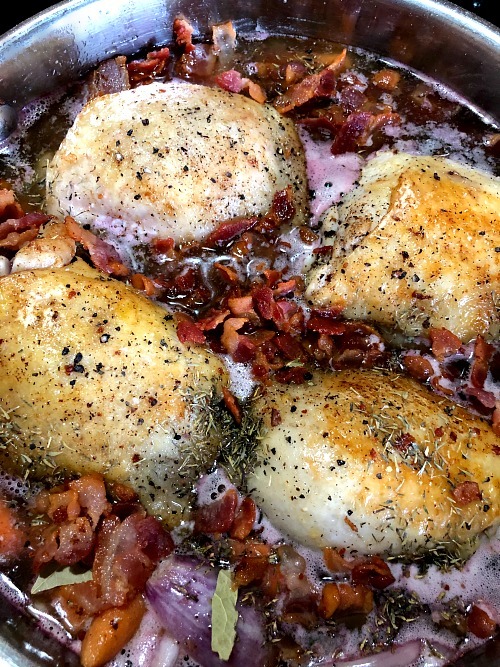 Chicken in Red Wine Sauce, or French Coq Au Vin, is made with braised chicken thighs, bacon, shallots, and carrots simmered in a sweet red wine. It’s perfect for Sunday dinner, or a special occasion. I adapted this recipe from David Lebovitz’s My Paris Kitchen, page 177-178. David’s recipe calls for marinating a whole cut up chicken in wine, vegetables, and seasonings for up to two days. I had decided that I wanted to make the Chicken in Red Wine Sauce recipe that day, so I skipped the marinating and it was was still delicious. How do you make Chicken in Red Wine Sauce (Coq Au Vin)? 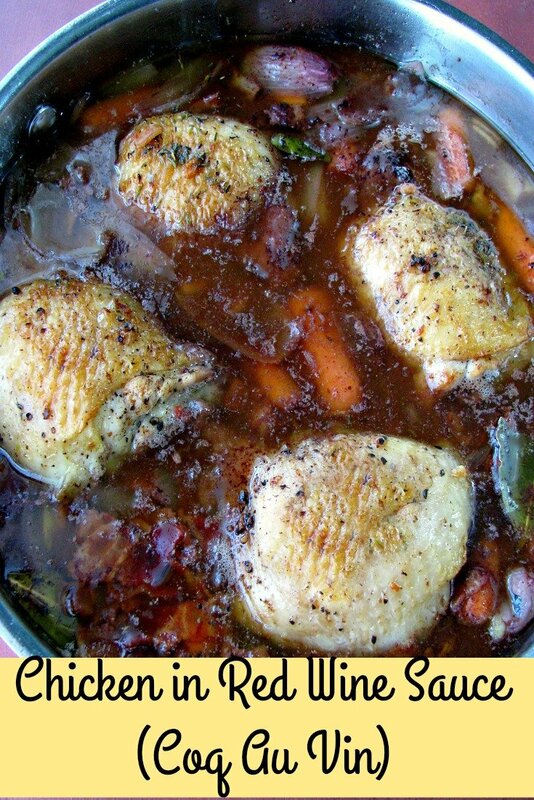 Chicken in Red Wine Sauce is made with a cut-up whole chicken, chicken breasts, or thighs braised in oil, butter, or bacon grease until browned, then simmered in red wine with vegetables. Traditionally, pearl onions are used. In this Coq Au Vin recipe, I used shallots instead of pearl onions simply because it was what I had available. 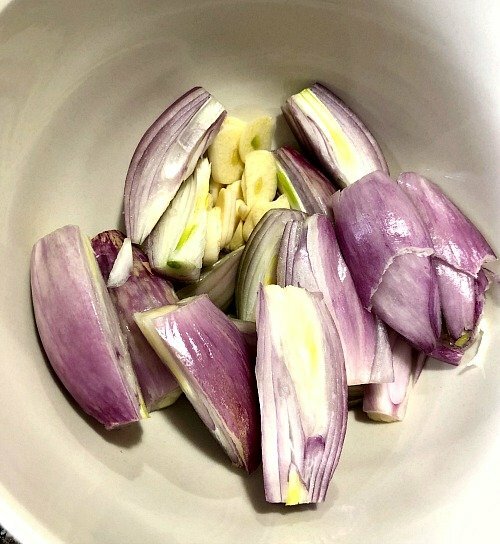 Slice four shallots into quarters and thinly slice four cloves of garlic. Saute chopped bacon in a deep saute pan or large pot. 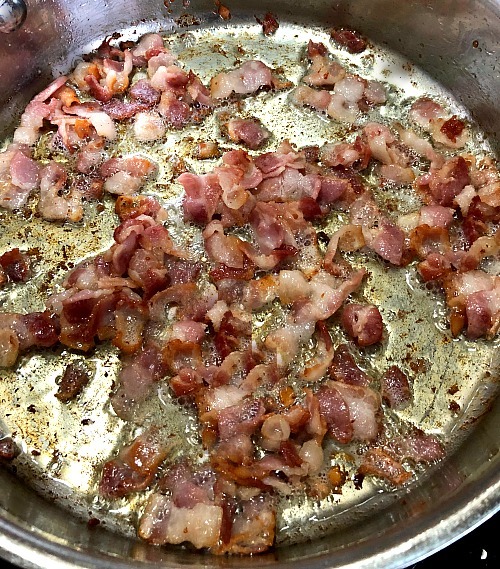 Remove the bacon from the pot with a slotted spoon (while turning the heat down on the bacon grease in the pot) to a paper towel lined plate and pat the grease off with additional paper towels. 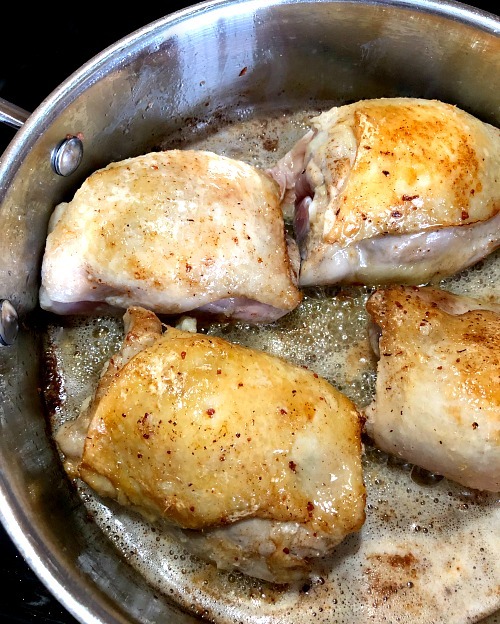 Raise the heat on the pot back up to medium, add bone-in chicken thighs seasoned with salt and pepper and cook for 5 minutes, or until browned. Turn with tongs and cook for an additional 5 minutes. Remove the chicken to a plate, set aside. Add two tablespoons butter to the pot, stir in baby carrots (or sliced carrots), shallots, and garlic. Saute for a few minutes, sprinkle with flour, stir until the flour is dissolved. Add the chicken and bacon back to the pot. Pour in enough wine to almost cover the chicken, or about four cups. Add two bay leaves and 1 teaspoon dried thyme leaves. Bring to a simmer, cover and simmer for one hour. Wait, doesn’t Coq Au Vin have mushrooms? Yes, it does. You could leave them out completely if you don’t like them, like I did up to this point. I decided to saute the mushrooms in butter separately and then add them to our dishes for myself and my husband, because our daughter will not eat them. After the chicken has simmered for an hour, remove some of the liquid from the pot to a bowl or measuring cup and add 1 1/2 tablespoon unsweetened cocoa powder, mix well. Add the mixture back to the pot, stir, and cook for a few minutes more before serving. 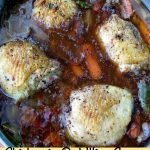 Chicken in Red Wine Sauce, or French Coq Au Vin, is made with braised chicken thighs, bacon, shallots, and carrots simmered in a sweet red wine. It's perfect for Sunday dinner, or a special occasion. Saute chopped bacon in a deep saute pan or large pot over medium heat until crispy. Remove the bacon from the pot with a slotted spoon (while turning the heat down on the bacon grease in the pot) to a paper towel lined plate and pat the grease off with additional paper towels. Raise the heat on the pot back up to medium, add bone-in chicken thighs seasoned with salt and pepper and cook for 5 minutes, or until browned. Turn with tongs and cook for an additional 5 minutes. Remove the chicken to a plate, set aside. 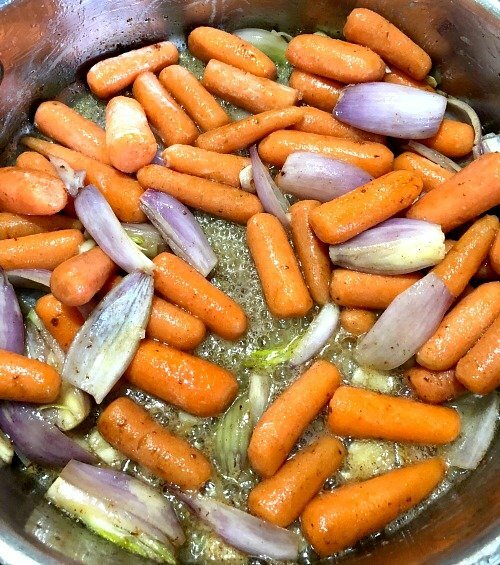 Add two tablespoons butter to the pot, stir in baby carrots (or sliced carrots), shallots, and garlic. Saute for a few minutes, sprinkle with flour, stir until the flour is dissolved. To saute the mushrooms separately, add two tablespoon butter to a small pot and melt over medium heat. Add the mushrooms and cook until heated through and tender, about 5 minutes. Otherwise, you can add the mushroom in with the wine before simmering the chicken.